Well, we enjoyed a rousing basketball game Thursday night, with the SDSU (SOUTH DAKOTA, not San Diego) Jackrabbits giving Baylor a run for their money in their first NCAA appearance. You have to love a team called the Jackrabbits. No one else has that team name, thank you very much. Our alumni association held a watch party at a downtown bar, and I had told my boss this was very important and I was going to leave at 3:30 to get through the traffic and attend. For a while there, Ken and I were among the 4 oldest people there. Eventually some more people who had graduated before 2000 appeared. We all grouped together and talked. We were NOT the ones doing shots, please note. One of my Facebook friends suggested that we tell stories about the olden days, when you had to look stuff up at the library, and go to division II games. Oh yeah. But it was very fun to be with a group of about 50 people, enjoying the game. One of the gals there was from Lemmon. And I said, oh, my uncle was married to B.H. from Lemmon (names changed to protect the googleable). And she said, “Was his name R.?” “Why, yes,” I said. “B’s mom is MY mom’s best friend!” she said. I tell you, South Dakota is one giant small town.Too fun. So I think for my next knitting party I am going to have to make beef salad sandwiches. I don’t have a grinder any more, (we also talked about how you need the big heavy meat grinder) (Mom still has hers that was a wedding present 48 years ago, from Aunt Lucille and Uncle Emil, she thinks) so I will have to try the food processor. This recipe is a pretty good approximation, although I don’t think we ever added anything so fancy as eggs, probably because my dad wouldn’t eat them, and you had to be real careful with the onions if he was eating them too. So, I am not trying to be disrespectful of anyone’s funeral, but most of the funerals I have attended have been celebrations of life, and I know the deceased would have been happy we enjoyed the food. Other things common at SD west river funerals (or maybe just Folsom, SD funerals): If there are sandwiches with lunch meat, there will be some with mayo and some with butter. Chips. Relish tray. BARS (how to tell a good cookbook, they have sections for cookies, and cakes, AND BARS!). And every kind of salad you can imagine. 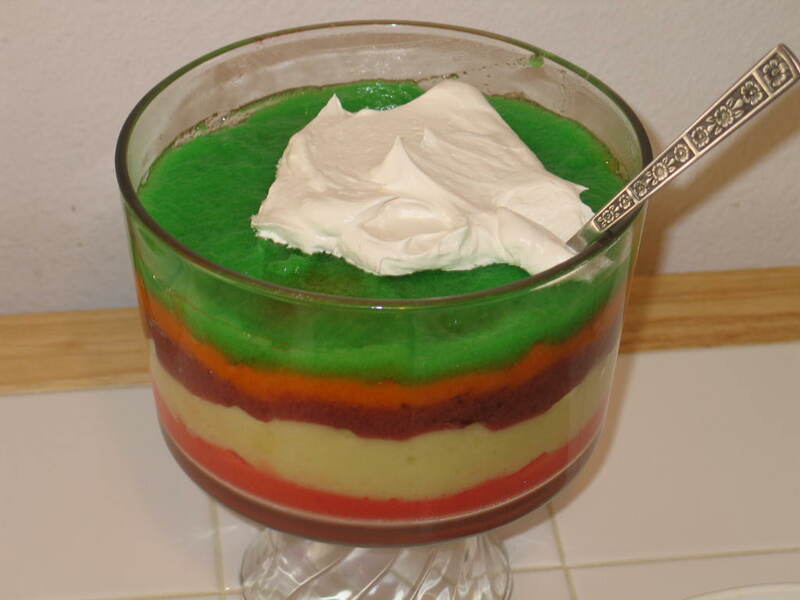 Jello with fruit, jello with vegetables, jello with mayo (ugh), Cool Whip in every incarnation imaginable. And KoolAid for the kids, coffee for the grown ups and ice tea if it is summer. I still go for the KoolAid myself. What am I missing as far as funeral food? What did you grow up eating at funerals? And, a picture of fancy Jello for your enjoyment. Yes, I made that, of course. This entry was posted in Cooking, Family by glenderella. Bookmark the permalink. I use my food processor to chop up the beef (and chicken and turkey) for salad meat like Grandma used to make. I used to love going hunting just for the sandwiches she would send along. 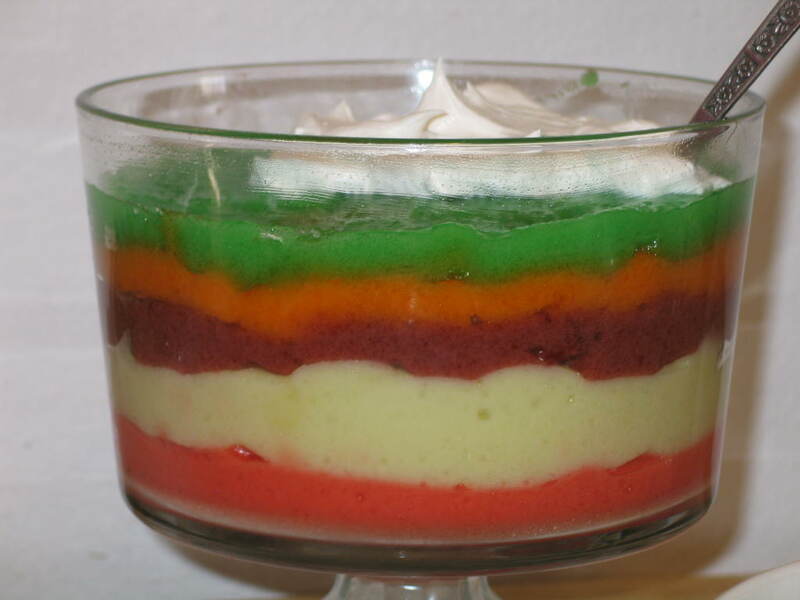 And Jello should ONLY have fruit in it .. no grated carrots and lime jello, thank you very much! Oh, man. I miss my Grandmother’s Ham Loaf! So yummy. Yes, the food processor is a good substitute for a meat grinder. I use mine all the time to make beef salad and ham salad sandwiches. After my dad’s funeral we had the obligatory luncheon with the usual “funeral food”. I was quite surprised to see the Funeral Director (I still have a tendency to call them morticians) show up. He sat with the family and mentioned that the real reason he went into funeral service eons ago was because he loved the lunches…”no better food anywhere” was his statement. I attended a funeral last weekend – coincidentally attended by the current president of SDSU and I believe the entire board of the alumni foundation (son in law of deceased is a ‘big SDSU supporter’) – and food served at the lunch was scalloped potatoes with ham, green beans with bacon and strawberry shortcake for dessert. Three of the deceased’s favorite dishes/dessert! And I enjoyed all three.